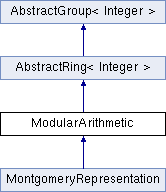 This implementation represents each congruence class as the smallest non-negative integer in that class. Definition at line 38 of file modarith.h. Definition at line 49 of file modarith.h. Definition at line 54 of file modarith.h. Definition at line 4489 of file integer.cpp. Clone effectively copy constructs a new ModularArithmetic. The caller is responsible for deleting the pointer returned from this method. Definition at line 65 of file modarith.h. Definition at line 4500 of file integer.cpp. Definition at line 4508 of file integer.cpp. Definition at line 4513 of file integer.cpp. Definition at line 83 of file modarith.h. Definition at line 87 of file modarith.h. Definition at line 92 of file modarith.h. Definition at line 99 of file modarith.h. Definition at line 107 of file modarith.h. Definition at line 4518 of file integer.cpp. Definition at line 119 of file modarith.h. Definition at line 124 of file modarith.h. Definition at line 4529 of file integer.cpp. Reimplemented from AbstractGroup< Integer >. Definition at line 4549 of file integer.cpp. Definition at line 4603 of file integer.cpp. Definition at line 4569 of file integer.cpp. Definition at line 4586 of file integer.cpp. Double returns Add(a, a). The element a must provide an Add member function. Definition at line 160 of file modarith.h. Definition at line 166 of file modarith.h. Definition at line 174 of file modarith.h. Reimplemented from AbstractRing< Integer >. Definition at line 181 of file modarith.h. Determines whether an element is a unit in the ring. Definition at line 187 of file modarith.h. Definition at line 194 of file modarith.h. Definition at line 202 of file modarith.h. Definition at line 4615 of file integer.cpp. Definition at line 4626 of file integer.cpp. Provides the maximum bit size of an element in the ring. Definition at line 227 of file modarith.h. Definition at line 232 of file modarith.h. Provides a random element in the ring. RandomElement constructs a new element in the range [0,n-1], inclusive. The element's class must provide a constructor with the signature Element(RandomNumberGenerator rng, Element min, Element max). Definition at line 242 of file modarith.h. Compares two ModularArithmetic for equality. The operator tests for equality using this.m_modulus == rhs.m_modulus. Definition at line 253 of file modarith.h.